Folk, including carers, enjoying Tea and Chat! This is one of our recently introduced outreach ventures for the local community. 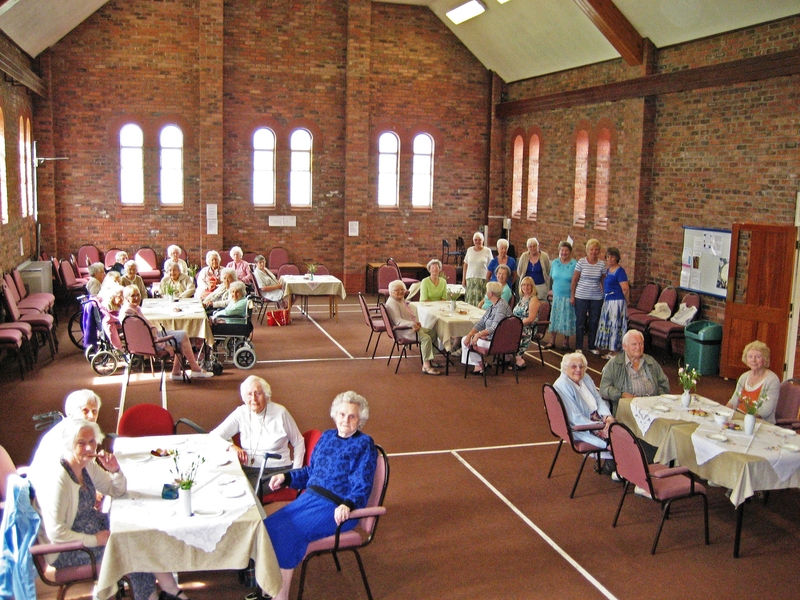 Residents from care and residential homes in Winsford are brought to the Church by carers from the homes, or by taxi, for the Tea and Chat sessions. These take place on the first Monday of the month, from March to October. Transport can also be provided for those still living in their own homes, but who have difficultly getting out and about. During 2017, this initiative received substantial support from Churches Together in Winsford (via the Council), Waitrose and AVIVA. Each gathering meets from 2.00pm until 4.00pm; entertainment, some games and crafts, and refreshments are provided; generally, up to 40 people attend. A number of Church members lead the sessions, co-ordinated by Ann Kilshaw. For further information, please telephone Ann on 01606 557091.